This homemade power hammer is the world’s first anvil mounted power hammer that is both portable and handicap accessible. 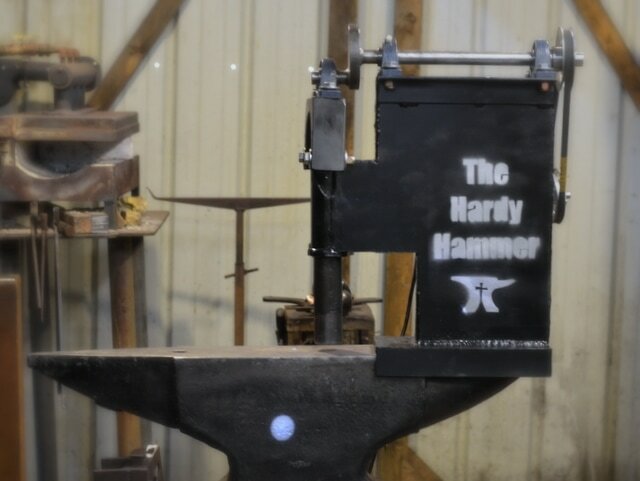 I’ve affectionately named it The Hardy Hammer, because it sits in the anvil’s hardy hole. I created this homemade power hammer with the part time blacksmith in mind. You only need a limited amount of tooling to complete this project (such as welder, drill press, and angle grinder with cutting and grinding accessories). The plans are professionally made and include measurements, individual part lists, and exploded diagrams. View additional specifics below. Purchase the plans below for $15. The plans include both imperial (US) and metric measurements. You will find the metric measurements in the plans with parenthesis around them, for example ( ). ​Please note: If you pay with Paypal, make sure you complete the transaction by clicking "Return to Site". Also, if your computer times out while the documents are loading, you can refresh the page, or check your email for a receipt that has the links too. See the Hardy Hammer in use! We've created many videos of making tooling and projects with this power hammer so that you can see it in use. The below link will take you to our YouTube playlist that has all the videos therein. If you'd like to see more power hammer plans, treadle hammer plans, and other downloadable resources for blacksmiths, please click the link below. ​Also sign up for our newsletter on this page.